What is Diamond Color & Color Chart? Is it Always “Higher Color Diamond” Better? A diamond color is graded on a scale from Colorless to Yellow, with colorless diamonds being higher priced (and supposedly higher quality). 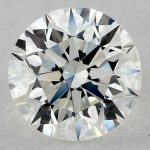 On a diamond certificate or when looking at diamond characteristics online you will see a single letter notation of D for colorless down to J for the lowest graded colorless diamonds. Technically speaking, there are many more diamond colors than this (D to J), this page deals only with white diamonds and does not get into the fancy color diamonds (The chart below will only include the K grade) which are a subject for a different page, Wikipedia has a nice article on diamond color with a diamond color chart. Update: Since Wikipedia chart goes into much details that are not necessary for a lot of readers, I have created my own Diamond Color Chart (below) where you can see actual photos of diamonds and not an illustration. I think that seeing the actual photos will give you a better idea of the small differences between each step in the grading system. While most retailers or online diamond sites will try and tell you that getting as high a diamond color grading as possible is preferred for the beauty of the stone, the truth is not always as they say, so please don’t take their word for it. Do you that that even when you take 2 stones that are a bit further apart (for example an F and H) you will likely only notice the difference when you hold the 2 diamonds side by side. 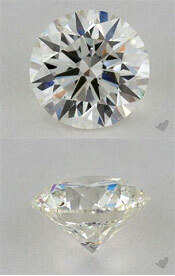 Looking at each stone on its own- there is just no visible difference between the diamond color of 2 stones. Diamond colors are subjective, not an exact science, so don’t ever think that someone can tell you exactly what color is this diamond without comparing it with other diamonds (that their colors are known). Need proof? Take a look at my diamond color chart below that shows actual diamond photos from James Allen own diamond color chart and look at some colors that are adjacent to each other. Can you tell the difference? Even on James Allen Color Scale which is an illustration that in my opinion overstates the differences you will still have a hard time seeing the difference. Update: I came across this really well-done video (from a 3rd party) that explains how diamond color grading works and confirms what I say on this page – spending money on a anything above H diamond color is just not worth it. What some jewelers might also neglect to tell you is that there are other factors that effect the perceived color of a diamond, like fluorescence. Even the setting that the diamond will be set in effects how the color will look in the actual ring. If the setting is yellow gold even an E color diamond may look slightly yellowish so why spend the extra money on this? 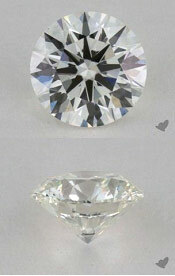 Here is a diamond color chart that I put together showing you similar diamonds with only the color being different. All the diamond images below are real diamonds listed on James Allen at the time of this writing. I provide the link to each one so you can see for yourself. These diamonds have been selected where other factors are equal, they are all between 1.0 and 1.05 carat and is an Ideal cut VS1 Round diamond. The only major difference between them is the color. See if you can tell the difference between two adjacent grades. 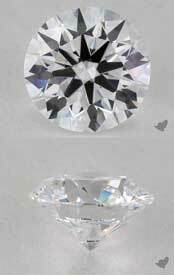 D Colorless diamond are one of the most rare diamonds ever, they are truly colorless (along with E grade). D Grade is also one of the most valuable grades you can ever find. Most gemologist can tell the difference between D & E grades by comparison side by side, only a few of them can detect that in naked eye without having the other grade in hand. E grade is coloreless as well, can't detect any color on it, it's valuable as D grade (almost). 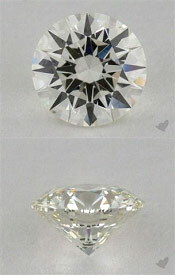 You need an experienced gemologist to tell the difference between D & E as stated above. Because when a gemologist looks at an F grade diamond as faced down, he/she can notice a very (undetectable) amount of color. D, E & F grades should be in set of white gold or platinum, because color is reflected in yellow gold, it won't appear nice because it will negate the colorless effect in those grades. G is the first line of near colorless grades. Also note that price tend to decrease 10%-20% from grade G down to J. 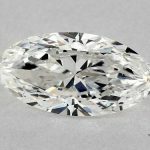 So a $1000 J diamond may cost around 60%-80% more if it was G grade. H is a bit less expensive that G, but still more than J & I. It can set (along with all near colorless grades) with platinum or white gold settings. You will see more & more of I & J in retails because they are much cheaper than other graded colorless & near colorless diamonds. Roughly speaking, I & J are almost half the price of D grade diamond. Same as I, it's the cheapest (cheaper that I), most people prefer to get it since it's the most affordable near colorless diamond. Yes, colorless & near colorless grades are much more expensive, but the K grade colored grade has a huge audience of fans, a lot of people love to see some color in their diamond, so they go shop for a K grade diamond, which shows a decent amount of color (compared to previous grades). Mentioning the price, K grade is almost half the price of G grade diamond. I’ve came across this quickly in the table, but I think it’s worth more details on the color effect on price. While there is a jump in price between each of the colors on the scale the single largest jump is between G and H colors. There is no technical reason for this – both are still near colorless diamonds and as I said before- there is no way you will tell the difference between them. See my Guide to Diamond Pricing for a better understanding of how the jumps between colors relate to pricing. Here is yet another diamond color chart from DiamondWave. What I like about this one is that it breaks down the colors by GIA and AGS grading guidelines. In my opinion the color chart is exaggerated and you won’t really see as much of a difference between colors as this chart claims. 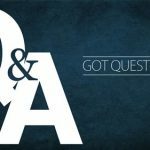 I hope this article answered all your questions & concerns about diamond colors, if you still have any questions, please feel free to comment, or drop me a message. 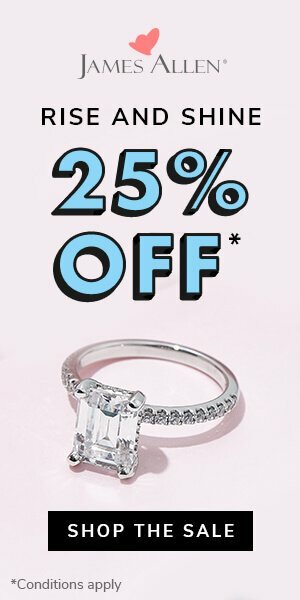 Does the size of the diamond I am looking at at all play a factor in terms of what color I should buy? 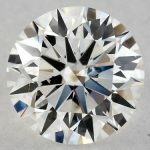 Do larger sized diamonds require a higher color grade? 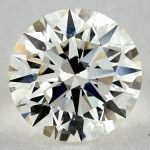 I am looking to purchase a 1.5 carat round diamond and I am concerned that an H color won’t look as nice as a G or F color. 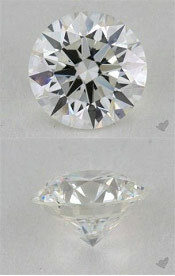 The shape of the diamond has more to do with what color you should be looking at more then the size. 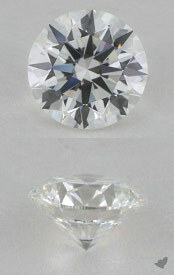 Even at 1.5 carat a round diamond will look great with an H color. 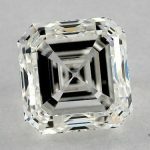 If you were going with a Princess cut I would recommend looking at a G color- Princess (and Emerald) tend to show off color more then other shapes. Whoa, I did not realize just how much of increase of price a diamond may have just for a little bit of color. I might as well just buy a colorless one to save more money since I really cannot tell the difference. Thanks for the comment- Just to clarify you will actually save more money by buying a “near colorless” diamond (H,I) range. If the diamond is going to be in a Yellow Gold setting go with an I color. If the diamond will be in a Platinum or White Gold setting you may want to go with an H as a minimum but even with those in most cases an I will be fine. This is pretty interesting. 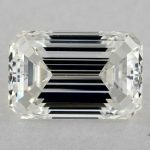 I did not know that there could be such a dramatic increase of price in a diamond just because it is slightly more colored than an uncolored one. This is really helpful. After reading this, I also have to agree that colored diamonds just aren’t worth it. I mean, I honestly can’t tell the difference between a uncolored one and a white diamond. Wow, there is so much more to diamonds than I originally thought. 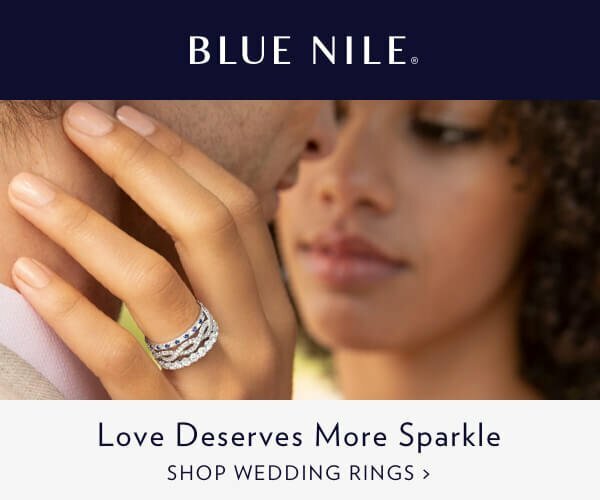 Always assumed that they only priced them by how big a diamond may be. Never would have thought that a little change in color could drastically change their pricing. I’ll keep this in mind in the future. Thanks for the tip. I really can’t tell the difference between the two. And the resources that you listed really helped out a lot. Especially the video and the pictures of the two diamond. It’s really difficult to tell the difference between the two. 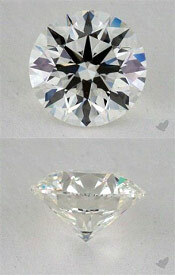 Although, I really do like diamonds, I just hate how much they charge just because of a slight coloring. It’s such a rip-off in my opinion to pay a lot more for the same thing just because of a little bit of coloring. The video really does help explain everything to me. 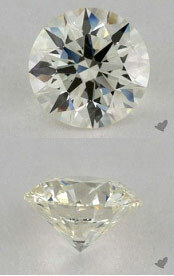 And wow, a such a microscopic difference in diamonds could really change the pricing that much? I understand deep yellow, however, to think that a colorless and a white diamond could have that much of a difference. Great post! I can’t believe that people would charge for outrageous prices on diamonds because it may have a little bit of color in it. I mean, looking at the charts, it’s pretty difficult to see the difference between a near colorless and a colorless one. I already know that diamonds are really expensive. Just can’t believe that there is so much more to it, rather than them pricing it by the size. It astounds me that they would price it a lot of higher just because a slight change in color. Especially if it’s a slight change that I can’t even tell.